In a must-win game, Milan played a very stale stalemate with the 17 th place Genoa. Most will argue that we drew because we played 65 minutes on ten men. However Milan took 17 shots with seven on goal, and still failed to convert. So it’s not as if they didn’t have their chances. But if we continue to play like this, our Champions League hopes will be all but dismissed. Fast forward to the event of the game: Leonardo Bonucci’s sending off. In the 25th minute, as they were struggling in the box, suddenly Rosi was on the ground, clutching his face and bleeding. Giacomelli appeared to have not seen anything, and took his time to call for the VAR review. This is important to note because no foul would have been called without VAR. When the decision came to send Bonucci off with a straight red, the first straight red given after a VAR review in Serie A, a lot of people were shocked. No one more so than Bonucci, who contended that he was just struggling to shake off the opposition players, of which there were two at the time of the event. And from most of the angles, that looked to be believable. However, from one angle, the elbow to the face looks quite intentional and very incriminating. If the Serie A disciplinary committee judges the foul to be “violent conduct,” then Bonucci will be banned for two matches, including our match with his former club on Saturday. They could even give him a three match suspension if they chose to. But from what I saw, it would be most fair to give him one match, and I don’t say that just as a Milan fan. 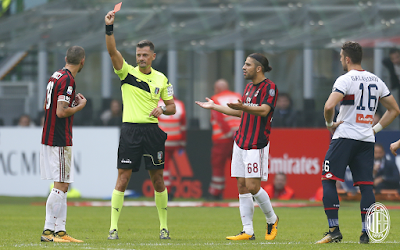 Montella, who almost never talks about the refs, pointed out that there were penalties that should have been awarded after both Kalinic and Bonaventura were fouled. But those infractions were not subject to VAR review, and thus went unpunished. VAR is not being used consistently. And if it were, the games would be stopping a lot more frequently, and I don’t know anyone who wants to see that. But thanks to Rosi getting bloodied to inspire the VAR review, our captain was dismissed. The rest of the match was largely unremarkable, save for Milan being on ten men. Which was almost better in some ways. Montella had lined up a 3-4-2-1 which wasn’t working on eleven men, and it seemed that there was a slight improvement initially on ten men. 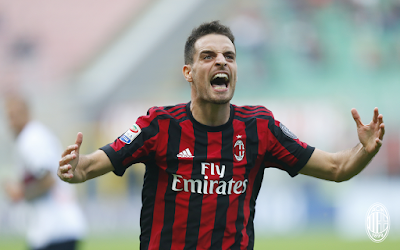 Montella wasa forced into using two subs early because of Bonucci’s red and a heartbreaking potential injury to Bonaventura. So his final sub was Cutrone, who brought a few sparks to the pitch, but not enough of anything to get a goal. Far more disconcerting than the red card or the inconsistency of VAR was Montella’s cluelessness tactically. He has been dropping massive red flags that he has no idea what he’s doing, while still being cocky and not taking responsibility for anything. Not a good combination. Meanwhile, management continue to drop hints that he’s got to figure things out because he is running out of time. And yet after each match, they confirm him. Sound familiar? Yeah, I don’t want to go down that road again. Losing morale is much easier than finding it, and we’ve already lost enough to seriously damage our chance at a top four spot. 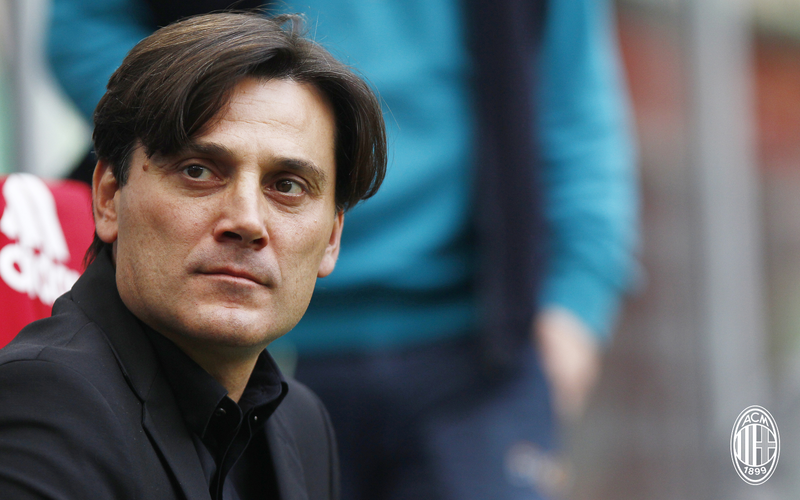 Regardless of positive words from management, it seems like sooner or later, Montella will be dismissed. A match on ten men, our captain sent off, and our coach flailing like a fly in a bowl of hot soup… and yet if the players had simply been more clinical, this would be a very different conversation. So despite the VAR, the foul, and the manager under fire, this team still wouldn’t have won this one. They simply don’t have what it takes right now mentally or tactically. So Montella needs to sort out his job and quickly, lest he should be dismissed.